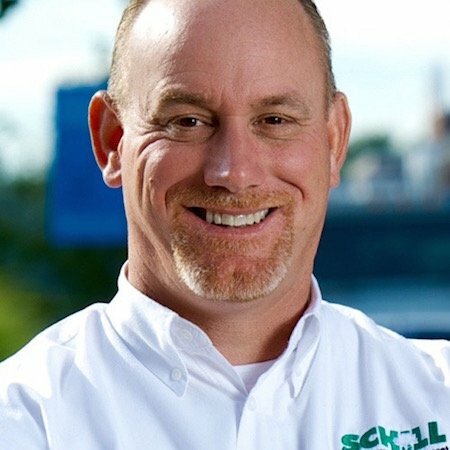 There is a range of commercial-grade mowing equipment that professional landscapers use to care for grass, and you might be wondering if the mowers your landscape company use on your Northeast Ohio property are doing the best job. When comparing a riding mower vs. push mower, there are benefits to both and experienced contractors have a fleet that includes both types of mowers. The mower choice can depend on your property’s size, the terrain (slopes, tight spaces), the environment (noise allowances) and budget. Both riding and walk-behind mowers provide benefits in terms of time, money and results. Here’s a breakdown of when a riding mower makes sense for your commercial property, and what conditions call for a push mower. Propane vs. Electric vs. Gasoline: What's Best? Most commercial landscape companies use zero-turn riding mowers, which are fast (mowing up 36 hp), offer wide cutting paths (up to 72 inches) and can turn on a dime (thus the name, zero-turn). You’ll also see some riding lawn tractors out there, but those are mostly used by homeowners or in large, municipal applications where you’ll see batwing mowers cutting fields of grass. Zero-turn riding mowers have evolved a lot in the last decade. They’re more comfortable for crews because of features like independent suspension, and they provide a high-quality cut. Riding mowers can cover ground faster than a person can push a walk-behind mower, and their cutting widths are greater so you’re cutting more grass, faster. Walk-behinds are typically 21-inch mowers while riding mowers are available with cutting decks more than three times as wide. When mowing lots of grass, efficiency matters from a time and budget standpoint. You just don’t want to pay someone to spend an entire day walking a mower across your commercial property when a riding mower could complete the project in a couple of hours—or less. Riding mowers are best used on flat land, or gentle slopes that will not pose a rollover risk to the mower operator. Professional landscape contractors know how to safely mow all sorts of terrain, including steep slopes. And when using riding mowers, they always mow across a hillside to avoid slipping. However, on grassy, steep hills, a walk-behind mower will provide more stability. Riding mowers are rugged machines that can cut very thick grass, even if it is wet from morning dew or recent rainfall. 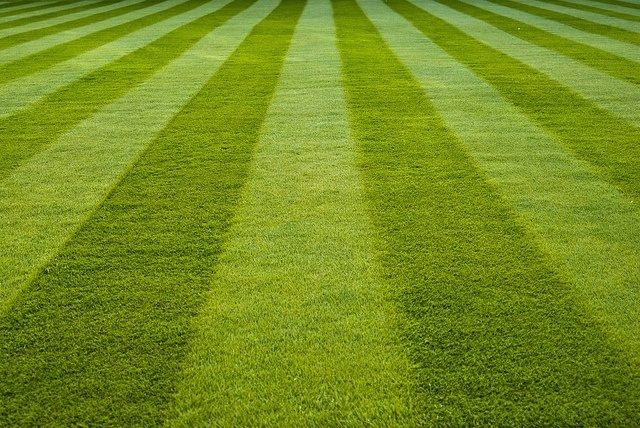 While a responsible commercial landscaper will avoid mowing wet grass because that can damage the turf, mowing damp grass is just fine and best accomplished with a riding mower. Walk-behind mowers tend to get clogged by the damp turf, and bag attachments can become too heavy to push. Push or walk-behind mowers used on commercial properties are self-propelled and offer a landscape team mowing flexibility. That’s because they can fit through gates, when some openings are not wide enough for riding mowers. Walk-behind mowers are also easy to maneuver and convenient when a property has lots of landscape beds that interrupt grassy areas. Walk-behind mowers can squeeze through openings and in between closely laid landscape beds when riding mowers are simply too large. A walk-behind mower can also provide a precise cut on lawn areas in between hardscape and walkways. Push mowers provide more mowing control when a landscape includes beds with curved edges and other borders against walkways, patios, driveways, etc. 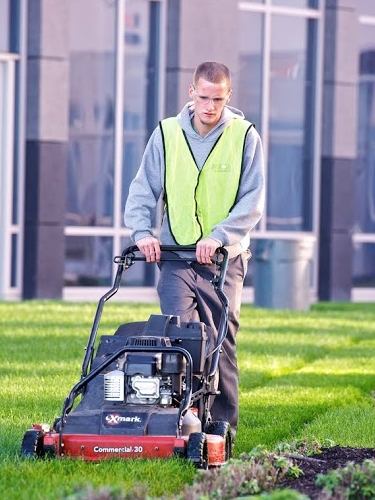 An experienced landscape contractor spends time evaluating your commercial property so the mowing crew is properly equipped to care for the grounds. Sometimes that means using only riding mowers on a property, or just using walk-behind mowers. Other times, we choose to use both types of mowers. That way, we can manage large, open spaces efficiently and deliver attention to detail in tight, curved grass areas. 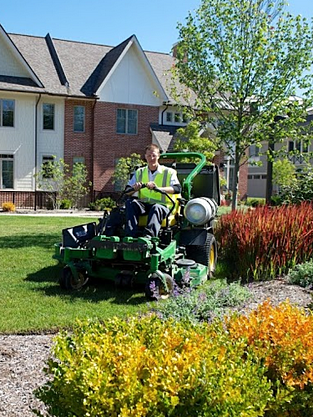 Let’s talk more about what type of mower is best for your commercial property, and how to request that the proper commercial lawn mower be used when you interview a landscape contractor. Ask about our fleet of propane-powered mowers — its the largest of any commercial grounds management company in Northern Ohio. Call us any time at 440.327.3030, or fill out this simple contact form and we’ll get in touch with you.